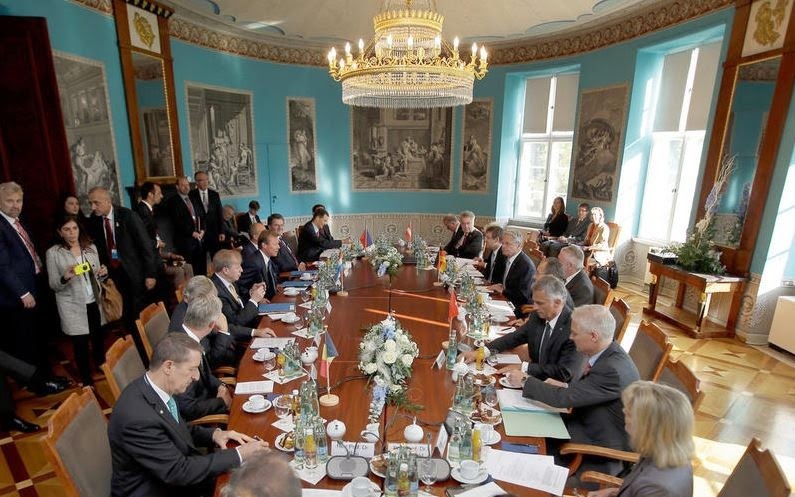 Today, the heads of state of the German-speaking countries came together for an informal meeting taking place in the German towns of Bad Doberan, Warnemünde and Rostock. 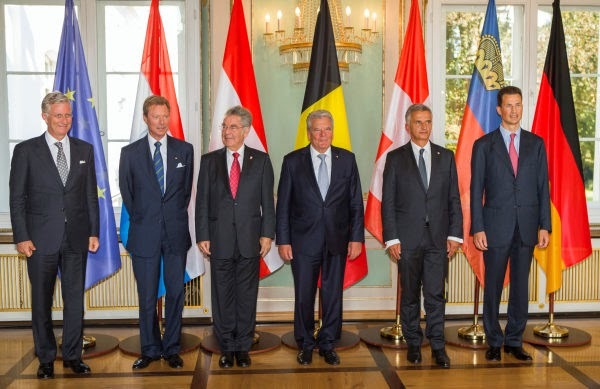 While the heads of state of Germany, Austria, Switzerland and Liechtenstein - those countries where German is the primary language of the majority of the population - have had these kinds of gatherings since 2004 (each year in a different country), this year marks the first time that the heads of state of Luxembourg and Belgium - countries that either have a minority of people who speak German as a first language (Belgium) or where German is one of the countries three official languages (Luxembourg) - are also invited. While all others arrived this morning, Grand Duke Henri as well as Hereditary Prince Alois and Hereditary Princess Sophie already made their way to eastern Germany yesterday. (Anyone else wonder whether the Grand Duke already had his suitcase in the car's boot when opening the Freeport thing late yesterday afternoon?) However, the were still only officially welcomed by the German President at around 9:30 in Bad Doberan at the White Pavilion this morning. After a few official pictures, the ladies and the gentlemen of the group went their different ways. While the (entirely male) heads of state had a working session at the White Pavilion to talk demographics, their first ladies visited Doberan Abbey together with Mecklenburg-Vorpommern's Prime Minister Erwin Sellering. Afterwards they made their way to Heiligendamm with the historical and scenic Molli railyway. Meanwhile, the (apparently) only one on one meeting - officially it was called "joined press meeting" - between two of the (well, basically) heads of state, Hereditary Prince Alois and Joachim Gauck, occured, before all the heads of state and their wives had lunch together on board the MS Käppt'n Brass ship starting in Warnemünde and then all along the Warnow river. At 2:30pm, the illustrious group of guests arrived in Rostock where they were welcomed by mayor Roland Mehtling. 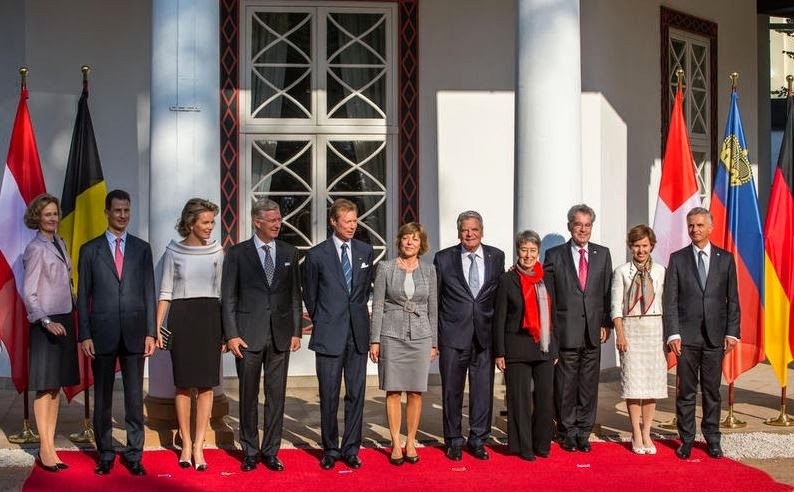 After their arrival, the German-speaking heads of state and their wives made their way to the Documentation and Memorial place in the former pre-trial prison of the Ministery of State Security of the GDR where they were welcomed by the Federal Commissioner for the Stasi Records and the head of the Rostock-branch of the commission, as well as the head of the University of Rostock and the associate head of the Research and Documentation Department for German Dictatorships of the university. Together they viewed the permanent exhibition. To round off the day, Grand Duke Henri, Hereditary Prince Alois, Hereditary Princess Sophie and their counterparts visited the St. Mary's Cathedral in Rostock. In 1989 - the year of the Fall of the Berlin Wall - thousands of citizens gathered in the church for peace prayers every Thursday to pray for the renewal of the society, and to express “forbidden” thoughts and points of view within a safe space. Many of those prayers were led by Joachim Gauck, then pastor of the parish of Rostock-Evershagen and today the president of the Federal Republic of Germany. At the church, the heads of state and spouses met with contemporary witnesses who were among those to gather there prior to German reunification. And then, at around 5pm, the whole thing was over and everyone (hopefully safely) travelled home again. For pictures, have a look at Belga, APA or OZ. Meanwhile, a video can be found at NDR.